Marang Buru is worshipped in Santals as the Supreme source of power. Which doesn’t possess any shape,face,idol. Marangburu is worshipped in the shape of nature. It will be totally wrong to consider him as ‘God’ or ‘Godess’. In actual, this nature is believed to be ‘Marangburu’ who gives them everything rain, water, air, land, forest, river everything that is present in this nature and which they use in their life . Dhiri, Nadi, Hoy, Hasa, Sengel, Da( Rock,Vine, Air, Land, Fire, water) or say the whole nature is Marang Buru in context of Santali. The literal meaning of Marang Buru is ‘The Great Mountain’ Marang means ‘Big’ or ‘Great’ and Buru means ‘mountain’. Feeling about the facts of life and how they are interlinked with the almighty ‘Nature’. 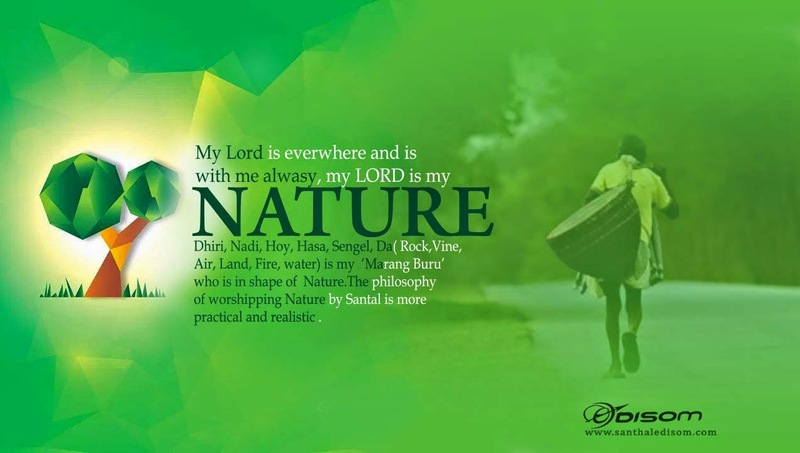 The Santals feels and experiences the Marangburu(nature) as a real friend or Helper of all people who helps them in their trouble and blesses their hard work. The Santals of course suffered a lot through drought, famine, epidemics and socio-economic oppressions, even poverty. Like when nature causes disasters, such type of calamities are believed to be the signs of Marangburu’s(Nature’s) displeasures. But at the same time the Santals have experienced God's merciful liberative acts recorded in the history of the Santals. As nature is the greatest strength whose origins are unclear as the world and thus can be considered as the supernatural power whose has controlled on everything, who is nature and who created the human and everything that we see in on Earth, in this way the philosophy of worshipping to nature by Santals is more practical and realistic. Their religious philosophy and belief is connected to river which helps them in cultivation, they worship to mountain and forest which gives them wood and other resources, they worship ‘SUN’ who gives light and energy and thus they call it ‘Sin Bonga’ (Sin in Santali means ‘Day’ or ‘Light’ or ’Sun’ and Bonga means God ) . Whether it be their religious philosophy , folk song, Community living or any social rituals, the philosophy, presence of nature is found everywhere. Sarna is the Munda word for ‘Sacred Grove”. According to the mythology of the Santhal community, the genesis of the ‘Sarna’ religion occurred when the ‘Santals had gone to the forest for hunting and they started the discussion about their ‘Creator and Savior’ while they were taking rest under a tree. They questioned themselves that who is their God? Whether the Sun, the Wind or the Cloud? Finally, they concluded that they would leave an arrow in the sky and wherever the arrow would target that will be the God’s house. They left an arrow in the sky; it fell down under a Sal tree. The after day after this, when women went to forest to collect leaf and other resources they found that arrow on Sal tree, they shouted “Sar na, Sar na” when they saw it. Those men came and yes got the same arrow to that Sal tree. Then, they started worshiping the Sal tree and named their religion as ‘Sarna’ because it is derived from word ‘Sar’ which means arrow in Santali and this is why their religious place ‘Jaher’ consists of a group of Sal tree’ where they do community worshipping. Thus, Sarna religion came into existence. There are priests and an assistant priest called "Naikey" and "Kudam Naike" in every Santhal village.